If that's an unusual way to characterize isolating the variable, that's because Aaliyah is an unusual teacher. In fact, she’s not a teacher at all -- she’s a student at the Envision Academy of Arts and Technology. Her algebra lesson is being filmed and posted on the Web. Videos like Aaliyah’s are the brainchild of Jared Cosulich, a San Francisco-based tech entrepreneur who specializes in cooking up ideas for Web-based businesses (a Yelp-like site for weddings! A way to donate your birthday to charity! ), and seeing if they work. He's deeply interested in education, and he’s creating a nonprofit known as the Upside Down Academy, hoping it'll catch on. Cosulich took Salman Khan’s now-famous approach to creating short, easily made education videos and turned it on its head. Under Cosulich’s approach, teachers or mentors don’t make these videos. Students do -- as soon as they've mastered the material themselves. Producing these videos creates distinct benefits, Cosulich says. First, students must understand a subject well enough to communicate it to other students. But there's an upside for teachers too. 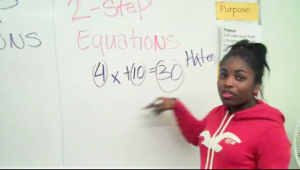 By watching students characterize math problems in their own vernacular, teachers might better understand how to explain the material using different approaches. Omar’s fellow student, Gibran Huerta continued the thought. “Coming from Oakland, I’m using this opportunity not to just show math, but to show that we’re not just what people think we are,” Huerta said. Envision plans to produce another round of videos, then step back and see modify what needs to be improved. As for the Upside Down Academy, it’s just getting started – and can go wherever teachers and students want to take it.